Fluorosilicic Acid is the chemical used in water fluoridation, below are just 3 accidents involving this highly dangerous substance. Up to 50 gallons a minute were leaking, acid started to eat through concrete bund, 500,000 gallons had to be diverted into Mississippi River to avert 'Catastrophe' involving other tanks. Ship transporting acid from Spain to Ireland, faulty patches on tank began to leak, within 72 hours acid ate through 8mm steel shell and sprang 2 leaks, also started to eat through hull of ship - port evacuated for 30 hours and declared 'Port Emergency' & 'Major Incident'. Tanker truck spills 4,500 gallons, everyone within 1-mile radius evacuated (2,300 people), 50 people hospitalised. The storage and transportation of these dangerous chemicals poses significant risks to Island residents. People living near to the treatment works in Douglas and Sulby would be at highest risk. People living and working in the ports of Douglas and Ramsey would also be at considerable risk, as are those living along the delivery routes to the treatment plants. An major spill in Douglas would result in over half of central Douglas being evacuated. 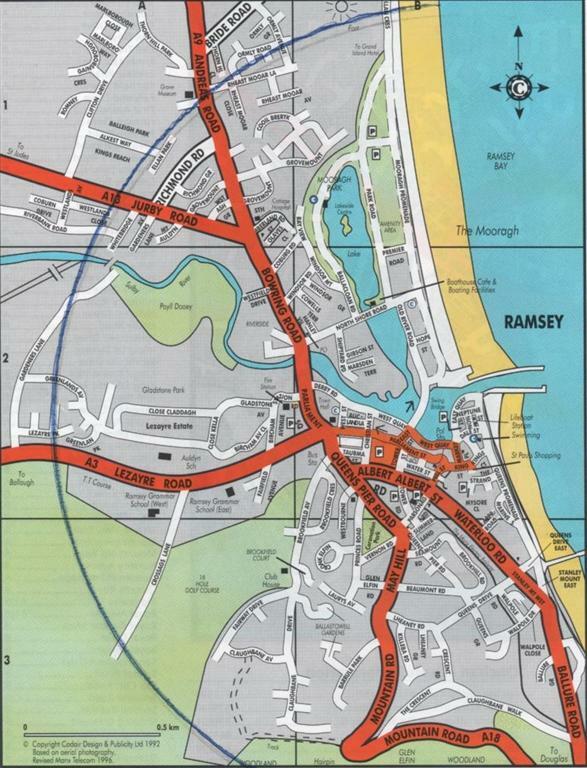 In Ramsey most of the town would need to be evacuated (see Image below). If a major spill were to occur in Ramsey Harbour people within a 1-mile radius would need to be evacuated. This would include the police station, fire station, lifeboat station, coastguard station, cottage hospital, all 3 schools, the town hall, all the shops and most homes.